At ArtFactory.com, we specialize in building modern doors inspired by designs from history. World renowned artist H.J. Nick of ArtFactory.com has spent decades studying classic architecture in search of inspiration for his latest designs. Among his favorite styles are from the American Arts and Crafts movement. This craftsman front door feature a unique, 3 column vertical wood and glass panel design that was inspired by the doors that can be found on may of Greene & Greene's craftsman houses throughout Pasadena, California. When building historically inspired doors, H.J. Nick believes that using the same techniques and materials as the original is especially relevant. These exquisite entrance doors are no exception. That is why our master builders construct all of our doors from solid, thick, naturally air cured, timber. Furthermore, all of our doors are hand hewn using the age old, tried and tested technique, of mortise and tenon joinery. This type of materials and construction ensure that your custom doors are not only historically correct, but are built to stand the test of time. This craftsman front door is a true display of style, security, and elegance, all in the same package. The glass panels are thick, insulated, tempered, dual pane glass for added security. You can customizes the look of your door by choosing from our dozens of different varieties clear, tinted or deco glass to choose from. We also offer a wide variety of glass textures to choose from. If you are so inclined, we have genuine hand cut stained glass, and even bullet resistant glass for those in need of maximum security. Additionally, all of our doors are finished using a multi-step, hand applied process that blends the stain into the grain of the wood. This process assures of a finish that will be long lasting with little or no maintenance. Not only that, but you can choose from over 400 designer stain colors or have us match to your existing furniture. At ArtFactory.com we have an unlimited amount of size, style, and color options. Most notably, H.J. Nick supervises the design and construction of each product that leaves our shop. Before any product is ever signed with the H.J. Nick signature, he inspects the item to ensure that all aspects meet world class fine art standards. This ensures that you will have an investment quality product with future appreciable value in antiquity. All of our hardware is finished with a hand applied, heat infused iron oxide patina. This patina is infused to the metal so that it won't fade, flake, or chip like paints and powder coats. The door pulls as shown have a brown patina finish, but can be customized to the color of your choice. Any of our custom doors can be fit with any of our hundreds of custom door handles or theme door pulls. If you don't like any of the choices from our extensive catalog, we can create one for you based on an picture or any design from history. With literally unlimited customization options, our ability to built the custom door hardware product of your dreams is limited only by your imagination. The doors, as pictured have been fitted with our American craftsman style door pull with a black patina finish. Like all of our custom door hardware, they are made from solid, blacksmith hand forged wrought iron. Our handles and hardware are never cast, drop forged, build from a mold, mass produced, or built using any other fast process. Blacksmith hand forging means a fine art quality piece that is built to stand the test of time. We build custom hardware with pure wrought iron because unlike other metals it will not corrode with exposure to the elements. Wrought iron lasts for centuries with little or no maintenance, builds a patina, and only looks better with age. First of all, this craftsman front door provides you with maximum security. Additionally, we build to investment quality and fine art standards. We design all of our custom doors for for use at either your residential, or commercial property. All doors come pre-hung in a structural solid wood jamb that can be mounted to a typical metal store front. We can also make any of our custom door designs into custom gates or custom garage doors. Make a proper first impression, that reflects your personality and accomplishments. Request a quote for your dream custom doors today. 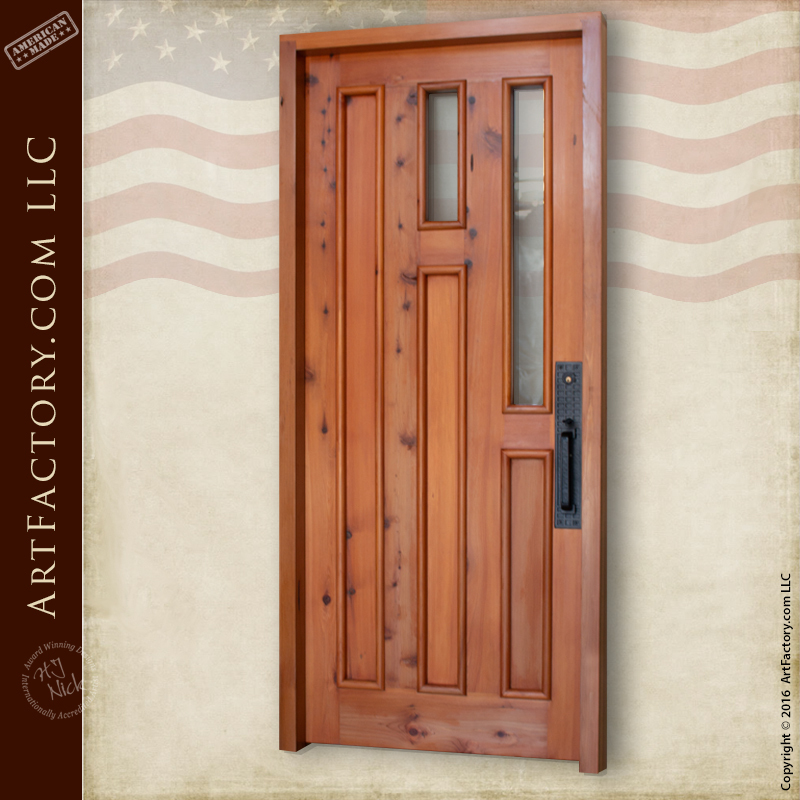 ArtFactory.com offers only the finest quality, artistic signature doors and entrances available anywhere, at any price. Most importantly, our expert craftsmen, wood carvers, and metal smiths create each door custom made to order. In other words, every product is a true one-of-a-kind. We have no limitations on size, design, thickness, or finish. All of our doors are virtually maintenance free, and more than surpass all hurricane codes worldwide. ArtFactory.com is proud to build 100% of our products in the United States of America, right at our Scottsdale, Arizona factory. Contact us at 1-800-292-0008 for pricing on a craftsman front door. We our so confident in the quality of our products and craftsmanship that we guarantee everything forever.